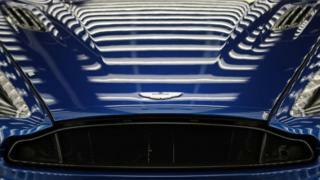 Aston Martin Lagonda notched up big losses last year, as the cost of floating on the stock exchange hit its results. Publishing its first results since it went public in October the firm reported a pre-tax loss of £68m, compared with profits of £85m in 2017. The luxury car firm also said it would set aside up to £30m as part of its contingency planning for a no-deal Brexit. Shares in the firm fell by 18%. In a statement the company said since its third quarter trading update in November 2018, "geopolitical and economic uncertainties have increased". It said that plans had been put into place the would mitigate any disruptions in supply, should the UK leave the European Union without a transition deal. It had also recruited a chief purchasing and supply chain officer "in anticipation of Brexit". So far the company has spent a "minimal amount" on its Brexit preparations. The results revealed that car sales rose by more than a quarter (26%) last year to 6,441. Sales by value were up by 25% to £1.1bn. The costs of the flotation came to £136m. If those were stripped out operating profits were 18% higher at £146.9m. Andy Palmer, Aston Martin Lagonda president and group chief executive, described 2018 as an "outstanding" year for the company. He said the company was confident that it would grow again in 2019. "Whilst we are mindful of the uncertain and more challenging external environment, particularly in the UK and Europe, we remain disciplined in our execution and maintain our guidance for financial year 2019, whilst also reconfirming our medium-term objectives."